The decision to establish a bowling club in the village of Renton was taken in March 1866 The following is a copy of the minute. With views to carrying out this proposition, the first step was securing the names of, say 50 to 60 individuals at not less than 20/- each member. As soon as this membership was obtained, they were to be called together to arrange a site and make the necessary arrangements. It was proposed that the Club should be select and not open to all and sundry. Messrs James Watt, Thos. Phillips, James Watson and W.D. Ralston formed themselves into a committee to carry out the foregoing proposition. James Watt was requested to prepare a sheet and procure names and subscribers and report. 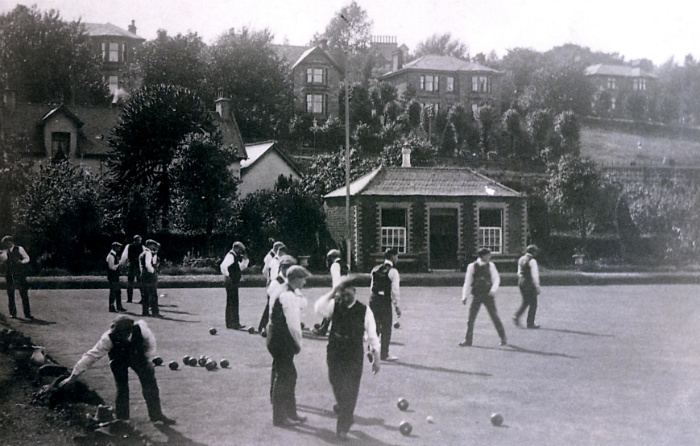 On 15th June 1866, James Watt had 60 prescribers present at a meeting when Mr George Graham proposed and was unanimously agreed that the subscribers be formed into a Club to be called Renton Bowling Club. The following were elected for 1886/87 season President: Mr George Graham, Vice-President: Mr R. Ritchie, Treasurer: Mr S. Pringle, Secretary: Mr A. Pringle, Directors: Mr D. Grant, Mr A. Robinson, Mr J. Watt, Mr A. McKie & Mr W. Murray. On 15th June 1866, Mr Alexander Smollett agreed to fue a corner of ground “immediately behind Messrs D.McCallum`s and D.Grant`s property as a bowling green at an annual feu duty of 1/-per imperial pole.” The ground measured approximately 80 poles. The green originally measured 36yards by 36yards and was constructed by a Mr George Young, Contracter, of Dumbarton, for a sum of £85 12/-. Fencing, etc. cost another £24. The first sod was cut by President Mr George Graham on 5th November 1866. The construction of the green involved the laying of 6″ stone, 6″ engine ashes and 2″ sand. Neighbourhood turf was used for the playing surface. Overall cost of the green was £200. The green was opened by Mr Alexander Smollett on 20th June 1867 at 3 o’clock. During the opening an instrumental band played a selection of music, which was also played at various openings. Quite a number of villagers turned out to see the proceedings. The first Renton BC friendly was played v Kilpatrick on 17th August 1867, the result was Renton 57 Kilpatrick 60. Our first game v Dumbaton was held on Monday 2nd September 1867. The first Annual Supper was held in the Black Bull, Renton on 1st November 1867. A report in the Dumbarton Herald on the first anniversary of the club noted that food and wine were distributed during this celebration. The first game against Alexandria was held on Tuesday 11th August 1868 at the Vale green; the result was Alexandria 85 Renton 107. 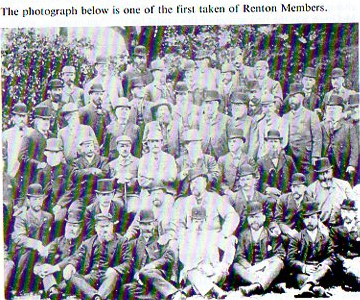 A return game was played on the Renton green on 22nd August and Renton won 97-49. In 1879 the green was extended and the bowlhouse rebuilt on its present site. This work cost £205 and the money was raised among the members, who took up shares at £1 apiece with the interest at the rate of 5% per annum. 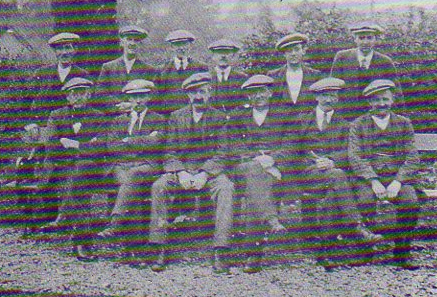 The Club joined the SBA in 1892 and was a founder member of the DBA in 1911. 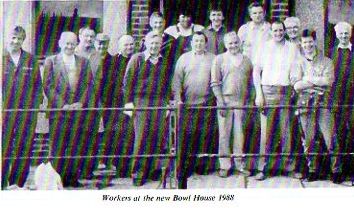 A new clubhouse was constructed in 1965 and in 1988 a new bowls house was built, the work being done by members of the Club. The Club has provided a number of Presidents for the DBA, namely J. Atherley (1917), A. McFarlane (1932), J. McKay (1948), T. McGowan (1976) and J. Gillies (2014) plus Presidents for the DAC, namely D. McGlashan (1973), Mr. J. Dines (1982 & 1991), Mr. F. McCarry (2000) and Mr. J. Gillies (2010). Renton has also had considerable success in the DBA competitions with three wins in the singles, two in the junior singles, one in the pairs, three in the triples, two in the fours and one in the senior fours, as well as securing four County Cups. In addition, the Club won the Under 45s championship twice and the County Top Ten two years in succession. In recent years Renton has enjoyed the most successful period in its long history and has supplied numerous players for the County Team.